Abhyudaya Bank Clerk Admit Card 2018-2019 has been released now. Abhyudaya Bank Clerk Online Examination 2018-2019 is scheduled to be conducted on 10th March 2019. There are total 100 vacancies. 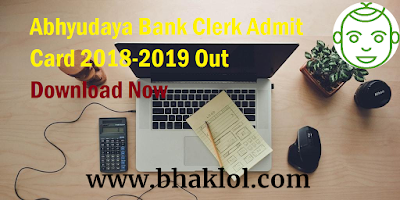 Username and Password are required to download Abhyudaya Bank Clerk Admit Card 2018-2019.